The earlier pAsuram mentioned about emperumAn protecting his followers. In this pAsuram, it is mentioned that even though emperumAn has attained everything, he still considers those materials which have been touched by his followers as the ones sustaining him. In each of his incarnations, he considers whatever materials sustain those who are born in that species as those which sustain him. As examples, when he incarnated as varAha (boar), the tuber kOraikkizhangu was his sustaining foodstuff and when he incarnated as krishNa (in the clan of cowherds), butter sustained him. thirumAlE – Oh the consort of mahAlakshmi! niRaiyumE – will it get filled-up? thEnAgip pAlAm thirumAlE – chAndhOgya upanishath 3-14-2 says “sarvarasa:” (emperumAn is sweet so that those who are in paramapadham (SrIvaikuNtam) can enjoy him). nampiLLai, with lot of involvement, will mercifully say that it is impossible to match the beauty of the way in which nanjIyar (his AchArya) would explain the line thEnAgip pAlAm thirumAlE. Thus, by the words vAnAgi and thEnAgi both nithya vibhUthi (spiritual realm) and leelA vibhUthi (materialistic realm) have been referred to. His status as the consort of SrI mahAlakshmi is superior to these two, in terms of his wealth. An Aychchi veNNey vizhunga niRaiyumE mun oru nAL maNNai umizhndha vayiRu – once upon a time, when there was deluge, you had saved the earth by keeping it in your stomach and later spat it out so that it could see other spatial bodies. Did you eat butter to fill up such a stomach (which held the entire earth within itself)? An Aychchi veNNey – cowherd women’s butter is just a material. 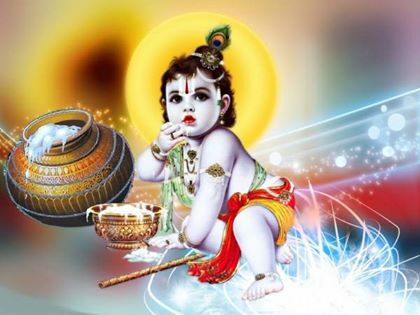 It appears that kaNNan (SrI krishNa) would not eat the butter if the strength of smell of the cowherd clan is reduced even a little bit in the butter! niRaiyumE – will it fill? Is it not required to stuff the entire expansive space inside the stomach with butter? Just as the samsAris will suffer because of deluge, kaNNan will also suffer if he does not get butter. It is said that piLLai uRangA villi dhAsar (a disciple of SrI rAmAnuja) would say that the space inside kaNNan’s stomach, which will not get filled up however much butter he eats, could be let out to washermen [the meaning implied here is that kaNNan’s stomach is similar to the washerman’s pot which will never get filled up however much clothes are filled in it for applying starch]. Let us take up the 93rd pAsuram next. This entry was posted in iyaRpA, mudhal thiruvandhAdhi on September 11, 2017 by T N Krishnan.